Not based on any particular prototype, it was constructed from plastic sheet and some oddments from the spares box (ie the window frames), after having a scan of some of the images of US towers on the internet. 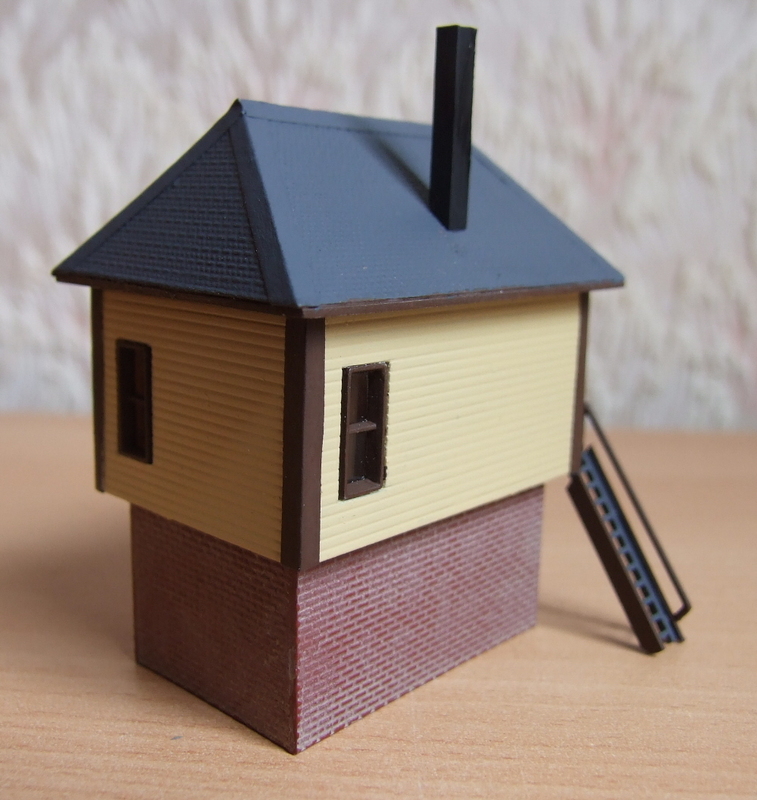 A bit faster job than my previous scratchbuilt signal box which was a 1/24 scale one based on an Australian prototype! Definitely a case of getting ahead of yourself, particularly as the baseboard it is going to be located on isn't even built yet! I was intending to scratchbuild a main station building for the elevated "main line" on the layout, as the buildings I had "in stock" didn't really fit what I wanted to achieve. By cutting it "in half", depth wise it has produced a long, narrow structure that fits nicely in the space available. With the tracks elevated, a lot of the passenger circulating area can be under the main viaduct, meaning the buildings don't have to be as large as a normal station. Some work is still in progress, as another 2 window section has to be added to the right hand side, along with a clock tower. Certainly works out more economical to "recycle" buildings off previous layouts, as well as a lot less hassle! I especially like the roof colour. Did you mix the colours yourself? I think it is very realistic roof! Windows and doors are nicely treated too!! They are actually standard "off the shelf" colours - I very rarely mix any of the ones I use. The roof is painted in Humbrol #88 "Deck Green" - presumably intended for ship models - which has been slightly weathered (as is the brickwork) with diluted Wilkinsons matt black water based paint - brickwork is Revell #37 red. The effect I was trying to get with the roof is weathered copper, which I have noticed on several structures in New England (The former Boston Elevated Northampton St tower, preserved at Seashore Museum, ME, springs to mind) and eastern Canada. This bus (former streetcar) shelter in Providence, RI, is a suitably obscure subject that I have photographed (!) which shows this type of roofing. 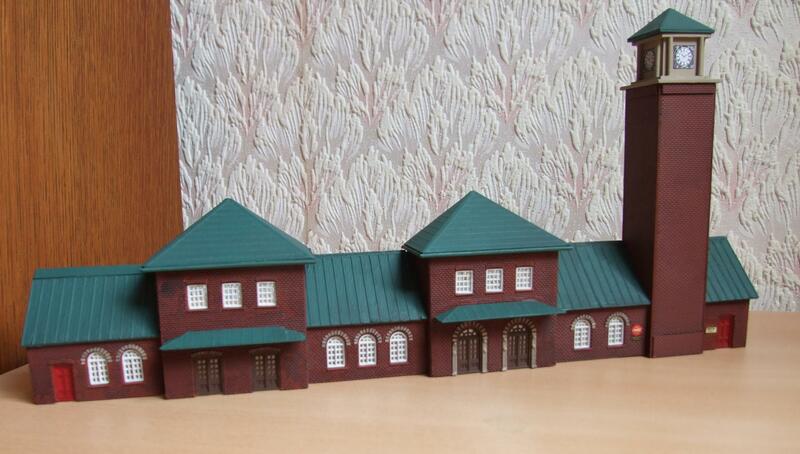 Not sure of the prototype of the original Heljan station kit, but it certainly appears to have this style of roofing. All the other parts of the building came from the original Heljan kit - the clock tower being constructed from embossed plastic brick sheet and some plastic strip & sheet oddments. I found the clockfaces on an internet search and printed them out accordingly! Still requires some signage, but I'm going to sort that out at some stage in the future for this and several other buildings. Some great looking buildings A very US feel. I've lived in a number of cities and spent time in almost 40 states and I can confidently say your layout could be in the Midwest, northeast, or south east, with ease Is there a particular area you are going for? The buildings remind me a good bit of Richmond, VA and Durham, NC, as well as some north eastern cities as some have mentioned That church is about the most southern thing I've seen on a layout (I'm pretty sure there are three just like it in the county I'm from!. The layout is based on a ficticious "North East" location - ie somewhere between Virginia and Massachusetts, mainly due to the fact that New England - ie the original 13 Colonies, is the part of the US I have visited the most. My liking for the PRR & NYNH&H is reflected in the majority of my motive power as well - plus I am interested in their respective electric operations over the years, so part of the layout will have overhead catenary masts. 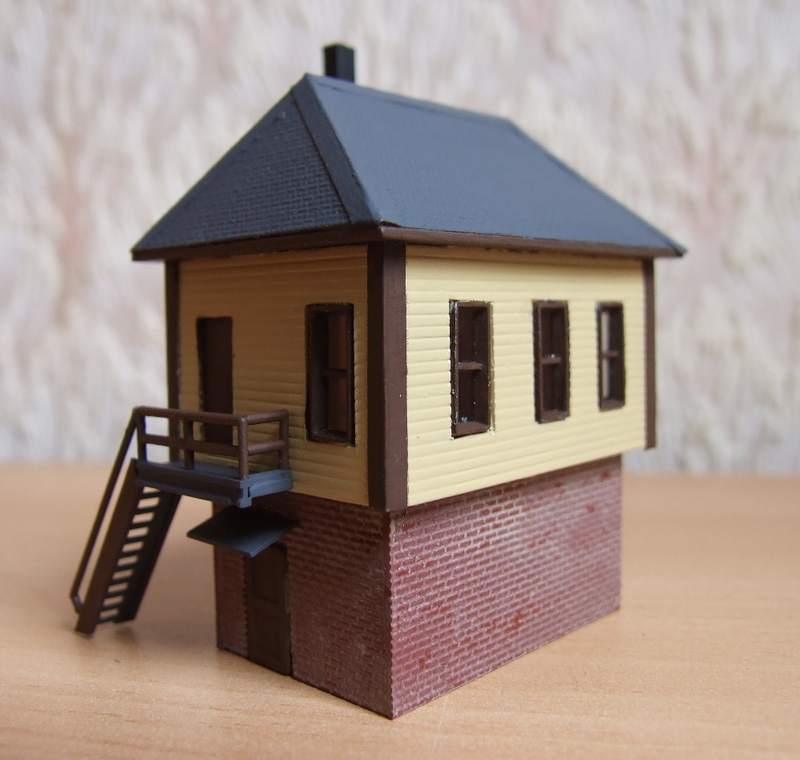 As mentioned earlier in the thread, I'm trying to avoid the wall to wall DPM/Walthers buildings you see on most North American layouts so am going to be scratchbuilding some prototypes which I have seen & photographed on my US trips. This and the building next door are the next on the "to do" list, but it will be a while before I get round to what should be an "interesting" challenge !! 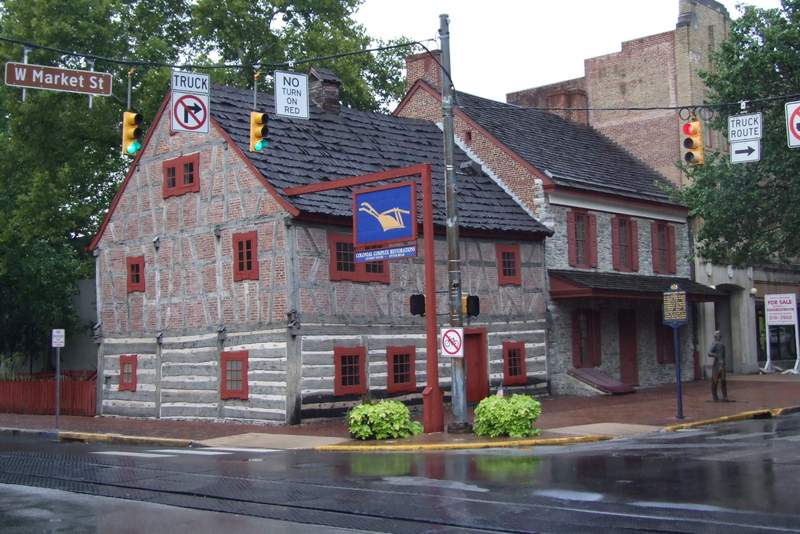 Believe it or not, I attended a wedding in York, PA in 2005, and I've been in there (or a pub that looked like it.....)! I'm much enjoying seeing your progress on your structures. 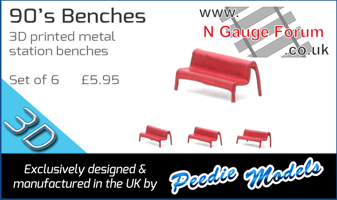 Nice modelling. It brings home to me how the architectural styles across North America really do show great variation. I too have a bit of a difficulty with most NA building kits in that the types of houses and commercial buildings are not well represented for the region I think I'm modelling which is south central British Columbia. It has an architecture that is much more similar to that in Washington, Oregon and Idaho. Brick building is not very common. I can see scratch building in my future. Have done very little in the North West on my various trips to the USA (despite going there 32 times! ), though I'm off to Portland (OR) & Seattle later this year, most of which is totally new ground. Have seen more of southern BC, but that has mostly been looking at it out of passenger train windows, other than when exploring the Vancouver/Victoria conurbations. Excellent stuff! Though the 13 Colonies included North Carolina, South Carolina, and Georgia and a Virginian would slap you silly for saying Virginia is in the North-East or New England If you want catenary masts the north eastern corridor is definitely your best bet. We are light years behind on infrastructural (rail) development, so basically only city transit systems have them in any meaningful way here :/ The north eastern corridor has a good bit more rail development than anywhere else in the country though, so it is most common there. 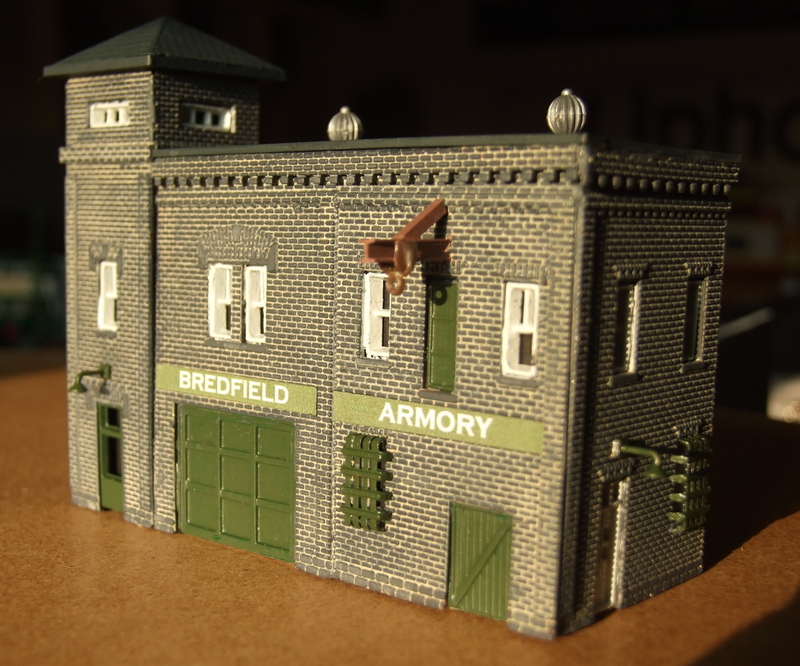 This is the last of the buildings to come off the "production line" for the time being. It is an elderly Heljan Fire Station kit that the original owner decided to turn in to a low-relief industrial building. I obtained it a few years back after a local (non model railway) group was bequeathed his Canadian outline layout following his death. The rolling stock was sold off fairly quickly, but nobody wanted the layout, so I made an offer for it to break up for spares. I have quite a few of his buildings, or parts from them, that are being used on the new layout. I've already got a Fire Station (Life-like one) but thought, with the tower on it, that this one would make a suitable Armory building. It appears that the Heljan production of N buildings has been cut back quite a lot compared to what it was 20 years ago, so this one no longer appears to be available.